This is a venture that comes from the very deepest part of me and encompasses many of the things that I love to do. Inspired by my late Puerto Rican grandmother, CREO means "I Create". My mission is to design cakes and other treats that are the perfect complement to your celebration, no matter what the occasion! I would love to design something special for you...just drop me a line! SO much going on this time of year. In the kitchen as well as out - but let's talk about baking. I have been busy with several types of pastry this month. Pie, cake and cookies. Here's the rundown. My brother was in town for a visit from California and I thought it the perfect occasion to make a pie. Especially considering we are celebrating the news that he is going to be the dad of twins in the coming year! Our fave around here is my Ginger Apple Crumb Pie, but I saw a really interesting idea on Pinterest to bump it up a little. Instead of regular crust on the bottom, I used a tube of Pillsbury Cinnamon Rolls (who doesn't love those?? ), rolled out and molded to the pie dish. Forgive the photo. The crust blends right into the counters! But LOOK at all those yummy bits of cinnamon-y goodness that will become part of the pie! I then went on with the rest of the recipe as usual, which is really more like an apple pie bottom and filling with a crisp topping. And of course, the ginger makes it amazing! I also add raisins when inspired. So I baked her up. Next time, I will reduce time a little as the cinnamon rolls wanted to burn a little more than a regular crust. But then, the BEST part...a drizzle of that sinful sugary icing that comes with the rolls. Ay-yay-yay..be still my heart!! It is simply delish - although very sweet. But, that's what pie us for, right? Also this month, a dear friend and excellent client requested a birthday cake for her fisherman husband. I love her for giving me free reign with designs, which allows for some clever twists on things. This is a choco-mocha cake with cookies and cream filling and vanilla buttercream icing. Topped with painted chocolate figures. I tried to make the fisherman resemble the birthday boy and think he turned out pretty great! Up next, the reveal of our fabulous new hardwood floors. Although not a DIY project, I am too excited about them not to share! I hope you all have a safe and happy new year! Until next time! I have never been a dog person. We had couple of dogs when I was young, but they weren't MINE and they were relegated to the backyard. Cats were always more up my alley. I think because I always believed they always shared the same sarcastic and jaded outlook on life that I did. You know, there's just something about cats that gives that impression. Well, now that I am the matriarch of a houseful of boys, the inevitable question of "when can we get a dog?" has arisen. So we are going through all the prep work...getting allergy tests, getting our much coveted hardwood floors BEFORE a dog comes (I do not want to train a puppy on carpet! ), researching breeds, etc, etc, etc. And you know what? I am getting pretty psyched to have the patter of 4 little feet in the house (just like having twins again - NOT)! Maybe I'm reading into this too much, but perhaps I am dog-happy because I am at a better place in my life. You know, I can now share that licky, waggy, yippy enthusiasm that a puppy brings - and also delight in the joy that he or she brings my boys. We'll see how happy I still am when in the midst of training and poop scooping. But, that will be a good time to introduce the boys to the responsibilities of pet-owning, right? Another dog lover recently asked me to create some cupcakes with a dog theme for her daughter's birthday. We decided on a combo on puppy faces, bones and paw prints and I am THRILLED with how these turned out! Pupcakes are constructed with halved oreos for ears, marshmallow for the snout, Starburst for the tongue and jelly beans for the nose and eyes. And lots of buttercream fur! Paw print and bone are fondant. Aren't they precious?? I just want to lick that puppy's face off! I hope I won't have doggie breath after! I had the honor of making my first NFL cake last week. A birthday cake for the son of a very special lady. Unfortunately, this Redskins cake was being made as the team was suffering a close, but still hurtful loss to the evil Dallas Cowboys ;) Scores aside, I hope the bday boy felt like a winner when he received this. White Almond Sour Cream cake with Chocolate Buttercream topped with a painted chocolate Redskins medallion and football cakeballs! Thankfully, the Skins pulled out a win this weekend. May more good things lie ahead for them. If not this season, then next. November was also a time of celebration for one of our favorite families as their 1st born celebrated birthday #6. Cole is a talented athlete, even at such a young age, and he is smitten with baseball. His party took place at a local baseball training center, where the kids got to play with the parents, while assisted by a coach. Hungry players received subs and cakepops after - celebrating Cole and his fave team, the Yankees. This photo was taken by his Mom, Stacy, who is a wonderful friend and gifted photographer. That's all for today. Hope everyone had a wonderful Thanksgiving. You know how one project always seems to lead to another and so on? Well, I am definitely a victim of that common syndrome. So let me tell you what led to this latest frenzy of sprucing up. It started with a plan for new floors, a painted door, holidays coming, plans for a new canine addition to the family. You get the picture and more on all that later. Well, the new hardwoods had me thinking that the dining room might then have lots of wood going on. Plus, I was loving some of the linen-look slipcovers that I was seening in mags and catalogs. So, here's my hi/low of dining room chair slipcovers. Here are the chairs. Dark wood, modern design, odd-shaped back. Because of the shape, I knew I could not buy slipcovers retail. Nor did I want to pay the cost. So, once again I went to my bookcase and found a book that I had purchased years ago about basic upholstery. 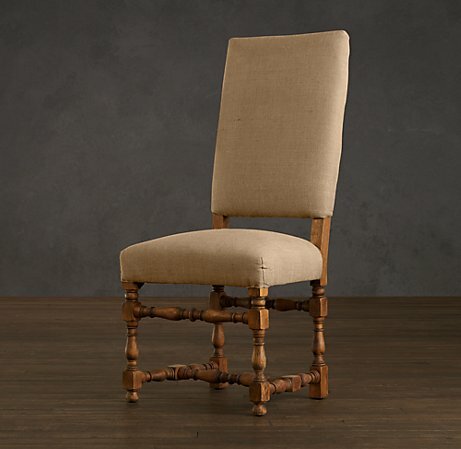 There were directions for a wood chair slipcover with a pleated back. Perfect! The pleat would allow me enough leeway to be able to slip the cover over the wide back top, but still have a tailored look. Next, I needed to make a pattern. I took all the measurements recommended in the book and transferred those to some basic muslin. The idea was to make a sample cover with the muslin, fine-tuning the dimensions as I pinned it onto the chair. I then did a loose baste on the muslin sample and marked where I sewed the seams. Once I was comfortable with the result, I took the sample apart and used it as the pattern for the actual slipcovers. I calculated that I would need 2.5 yards of fabric per chair. Then I was off to the fabric store. I had an idea of what I wanted. Something neutral with maybe some texture or tone on tone design. I found several that I liked, but the costs ranged from $10-$28 per yard. WAY more than I wanted to spend - even for the low end. I then saw another blog (how did DIYers live without the internet??) where someone used a painting dropcloth for curtain panels. I went straight to Lowe's to see what sizes they had. I noticed that the dropcloth actually had a really nice raw texture to it. Much like the imperfections found in raw silk or linen. Then I saw this collection from Restoration Hardware and I knew I was hooked! The best part...the dropcloth cost me $30 for all the yardage needed for all 4 chairs!! I WILL be using this material again when I re-do the curtains in the playroom. I am giddy with excitement over this find! Now...I will not claim that this was an easy project. I am not a master, or even experienced seamstress. I would consider myself "decent", and the result shows as "pretty good". It was a challenge and I had to re-do several of the seams. It was a bit painful. However, I love the pleat detail and I jazzed it up a little and finessed the fit with the addition of grommets and some leather lacing. Cute, huh? My corners, etc are not perfect, but I am very happy and can't wait to see the effect once the floors are done! Until next time! Redskins cake in the works! When brainstorming my vision for this little company and blog, I wanted to make it as all-encompassing as I could. I have a severe case of design ADHD and did not want to limit the things that I could put out there. That's why I chose the name that I did. Creo is comprehensive and much more broad than say, Cathy's Cakes. Cute, but no, thank you. I run the risk of being all over the place with my topics. But, whatever. The benefit is that hopefully you won't get bored! When I am not baking or crocheting, house projects consume the creative corners of my mind. I am all about sprucing up on a dime and LOVE the fellow bloggers out there who are as devoted to this mindset as I. They are an endless source of inspiration. This project is one that I completed a year or so ago - but I have been planning it in my head for about 14 years. Ever since HGTV came into my life and taught me that I can do it too! We were in need of an ottoman/coffee table/storage, and I loved this one from Crate & Barrel. But at over $500, it was simply beyond the budget. So, I knew if I could find a pre-assembled frame, I would be off to the races. I started a search with ReStore (the Habitat for Humanity store for salvaged and donated materials), but scored on Craig's with a listing from a local thrift store. They were selling salvaged kitchen cabinets and I found one similar in shape to this one. I think mine is a little deeper, but you get the gist. 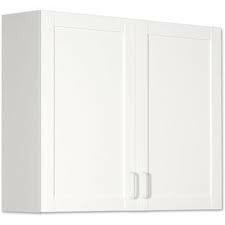 Tip: get a real wood cabinet - it will hold up much longer than manufactured wood products. Next step was to take off the doors so that I was left with just the frame of the piece. The one that I bought had lots of old nails in it that were not removed during demo, so I had to carefully remove those. I then started measuring. Each surface was measured separately and then I calculated how much total fabric yardage I would need to cover. I used an indoor/outdoor fabric for extra durability. I also stuck with a solid so that I wouldn't have to worry about matching up stripes or patterns. Also needed was upholstery batting and a piece of foam for the top. ﻿I bought 4" thick foam at Joann - and it is very expensive - so I used a coupon to offset that expense. Lastly, a piece of plywood, a piano hinge, a staple gun and casters. I took my top measurement with me and Lowe's cut the plywood for me. - cut 4 panels of fabric to the dimensions of each of the 4 sides of the base frame. Left plenty of extra allowance for seams and stapling. With fabric right side in, sewed the 4 corner seams so that I was left with a fabric box. Made sure to use a heavy duty needle and upholstery thread in my machine. Slid the fabric square onto the base (it fit very snuggly) and stapled the edges underneath and inside the top - pulling tightly as I went. Here is a pick of what the inside looked like after this stage was complete. - used spray adhesive to attach the foam cushion to the plywood. Then covered with batting and stapled, pulling as tightly as the batting allowed without tearing. - cut a panel of fabric for the top and 4 panels for the sides of the top. Sewed the seams so that I had what looked like a shoe box top. - Fit this over the top of the foam and batting, pulled tightly, and starting with the sides, started stapling. Did the corners last. - Screwed on the piano hinge, applied casters and loaded it up! Here is my baby - so proud of it! All for a total of $130. Heck yeah!! And you can do it too!! Well, this was fun! A little departure from sugar and spice - but still very nice! Look forward to sharing more projects! Working on making slipcovers for the dining room chairs now! One of the great things about this gig is all the great party ideas that come my way. You folks out there are so fun and creative! Each time I do a new cake, my kids follow with a bellow of "I want a [insert theme here] party too!" We'll have lots of ideas to throw around once party planning begins for our household. A couple of weeks ago, I had the pleasure of baking a cake for a cutie-pie 6 year old who was putt-putting it up for his big day. His Mom asked for something "dimensional" to fit the theme of the venue. Gladly!! I tried to capture all the typical icons of a mini-golf course. Animals, palm trees, windmills, bridges and streams - all made of sugar! The bridge is constructed of gumpaste, the greens and water of fondant. The birthday boy and the other features are all painted chocolate...100% edible images! What's your party theme? Let me create something special and unique for you and your loved ones! This week, I built a cathedral. Ok, so not a real one, but it still felt like quite an accomplishment. I have always been obsessed with design and architecture. Beginning with my habit of rearranging my room every few weeks as a young lass, to my absorption of all things man-made during my many years of world travel. I am so lucky to have seen some of the most spectacular construction on earth and I think I would be an architect if given a chance to do it all again. This week, one of my favorite people, Sue, hosted a going-away for her daughter's friend who is moving to Germany. Sue asked me if I could pay tribute to Cologne and its magnificent cathedral through a cake. Well, I couldn't wait to jump at the chance. Rather than pursuing a very literal translation of the building, however, I wanted to find a way to portray it in a more abstract way that would lend itself to the "hand-made" qualities of the painted chocolate technique. 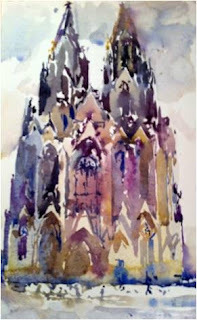 I managed to find a watercolor painting of the cathedral that became the perfect launch pad. I love the tertiary color palette and the dreamlike quality of this painting. I made my version multi-dimentional by creating 8 layers of "structures". And added a good-luck greeting to Glo (the guest of honor) in German and some whimsical embellishments. All atop a Choco-Mocha cake with Cream Cheese icing that Sue raved was delicious, moist and not too sweet. Before I sign off, I have to take a moment to brag about my offspring. They are only 6 (twins), but already seem to share their Mom's wanderlust and fascination with design. We have plans to paint in Paris one day, and build a hotel in NYC, where we will live. Avery is particularly handy with a pen and chose the New York skyline as this week's artistic subject. Seems he may have some talent - I may put him to work in the kitchen soon! Last month, I had the pleasure of providing treats for a couple of very special events. Firstly, family friends celebrated their 50th wedding anniversary. Such a special time for them, and they topped it off with a rafting/camping trip in the Grand Canyon and trip to Carmel, CA. I want to do that on MY anniversary! Hint, hint, honey. Before they left, I sent some Golden Anniversary Cakepops their way...White Almond/Buttercream and Red Velvet/Cream Cheese. Delish and fancy!! The following week, I was asked to make a cake for a baby boy's Christening. His Mom asked for blue with a nod to their Irish-Catholic heritage. The cake is Carrot-Ginger with Lemon Cream Cheese Icing. The lace effect is called Cornelli and is one of my favorite piping designs. Elegant, but modern. The cross and shamrocks are gumpaste painted with silver Luster Dust. Taking orders for fall now so keep me in mind for your next celebration! Revealing the mystery of "Painted Chocolate"
How was your summer? Ours was fantastic. Busy, but in a really good way…exploring lots of new places and things and making lots of great memories to boot. We could have done without an earthquake and hurricane (and several downed trees), but our health and house are intact, so thank God for that. I also managed to keep the business moving forward, without being overwhelmed and taking time away from the litter. But something has been weighing heavy on my mind. Due to several questions and confused inquiries, I feel as if I have not done a very good job of explaining some of the techniques that I use in my work. Some of them are not commonly used, so I am not sure that folks completely understand what they are seeing in my portfolio or, in some cases, even ordering. Time to clear that up because I think that these techniques are really special! I am speaking mainly of the painted chocolate technique that you see topping many of my cakes and cupcakes. I think it may be the term “painted chocolate” that is confusing. In truth, it’s not painting on chocolate…it’s actually painting WITH chocolate. The other thing that might be confusing is the word “paint”. It might lead some to believe that paint is not typically edible, so the toppers must just be decoration. All the colors are chocolate that has been tinted with food coloring. The chocolate is melted and “painted” into the images that you see on my cakes. It’s building a piece of edible art! I discovered this technique when I first started researching for CREO’s launch. I LOVED the vibrancy of the colors and the fact that it was not a widely used method. My wheels started instantly turning with all the designs that I could create. I’m not gonna lie, it is labor intensive and the chocolate is very temperamental, but the theme options are virtually endless and it offers a client a truly one-of-kind treat that is 100% edible! Most fondant or gumpaste embellishments are not edible, not to mention that fact that they would not taste very good if you did try to eat them. With all that in mind, I thought it would be fun to show you a quick step by step so you can see what goes into this technique. During initial consultation with a client, I will get an idea of the theme they want portrayed and how many servings will be required. I then go to work developing a blueprint of the cake and researching what kind of images I can either draw myself or find elsewhere. Alot of thought goes into figuring out what images will translate well into chocolate so that the final product is completely recognizable. Once I decide the images, I begin painting. The image is inserted under parchment paper and an outline is drawn, typically using a dark color chocolate. It’s very difficult to get a thin or stable line using a piping bag, so I often use a toothpick for this step. This is probably my least favorite part of the process as it is extremely time consuming, but it’s necessary to get a clean line. When the outlines are done, I begin melting additional chocolate shades and adding the details of the image. The trickiest part is figuring out in what order to lay the colors, since I have to build the image from front to back. Finally, I fill with the most dominant colors, making sure to build the chocolate to a sufficient thickness so that it will not break. When the pieces are hardened, I peel the image off of the parchment and turn it over to reveal the front. Where possible, I make extras…just in case! These precious reptile toppers were made for a close friend’s son’s 6th birthday party. Nature experts are actually bringing a reptile petting zoo - snakes, lizards, spiders, turtles and a baby alligator - to their house for the kids to learn about and interact with! Such a cool idea – but let’s hope that the cages are sealed tight! I hope this helps clear up the mystery around this method. I’m sure it has been keeping all of you up at night. If anyone has any ideas for better terminology for this technique, I am all ears! Now don’t get me wrong. I love me a list. My life would be a shambles without my penned collections of various pressing tasks. I typically have several lists working at the same time. Things to do for the boys, the house/garden, family, school, wishes, to read, blogs to visit, recipes to try and a few others..all of which I pull from each week as I am compiling yet another list of immediate things to do/people to call/things to purchase for that week. It seems insane to have to manage all these items, but I swear it helps me to be the kind of get-it-done person that I am happiest being. It’s like ice cream to me when I see all the little check marks next to the things that I have accomplished – and like bikini waxing when I am just unable to get the jobs done. And I know I’m not alone with this obsession. You know who you are. Since launching this little business of mine, I have had to take list-making to a whole new level. I thought that my physical and mental lists were daunting before I started this. Well, forget it. The fact of the matter is that a small business owner is not ever able to “leave work at the office”. Especially those who are a one-person-shop. That person is Owner, President, CEO, CFO, COO, CTO, and whatever other C-blank-O you can think of. Even if there is not an actual task to be completed, the mental burden of keeping the business moving and growing is pressing. It’s that wake-you-up-in-the-middle-of-the night kind of stress because you know that success is all up to you. And my business is REALLY small. I can't imagine what it would be like to have a real storefront with employees and all that goes with that. Hats off to those brave souls. With August comes vaca time for many, and a little order reprieve for me. So, it’s time for some tending to the CREO lists so that I can keep this little train chugging. I need a new printer, want to design a brochure to distribute in the neighborhood, develop a tasting menu for a corporate consultation, work on a Richmond cake that I have had in my head for months, do a trial run of a cakepop shipment and get a jump start on some hat orders. Breathe, Cathy, breathe. And get to work, because you know you hate waxing. This past week, I made a hunk of cake that was a cake of a hunk. The request was for a personal cake to match a Magnum PI-themed 40th birthday party. The wife was re-creating her husband’s adolescence with a party at his childhood pool and a big nod to one of his TV idols. I made his favorite: 4-layer red velvet with scrumptious cream cheese icing (maybe the best I have ever had). Topped with hand-painted chocolate icons. Word is that it was a huge hit. I feel especially blessed this week. I was visited by one of my sister-friends. You know, the kind who knows everything about you and loves you anyway. She and her amazing family were here all the way from Seattle. Oh, how I love that girl. And then, yesterday, we went to a birthday party for a sweet 3 year old who belongs to some of our closest friends. Friends who now go back over 11 years! That is hard to believe. Stacy is the beautiful, brilliant photographer who took our family portraits last fall and we are finally able to return the favor with a special cake for little Nolan. 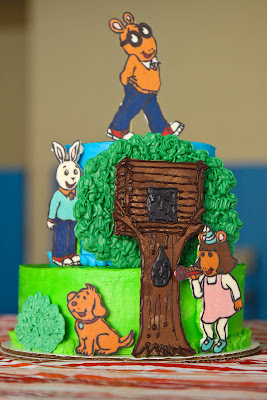 He specifically requested an Arthur cake and I was happy to oblige! The cake features Arthur and some of his closest friends, along with their treehouse hangout - all done in painted chocolate. I encourage you to check out Stacy's blog http://www.myliminalmoments.com/. Her writing is as beautiful as her photography. Be sure to check out my full gallery above and sign up for my blog feeds through your email. And by all means, contact me if you have cake needs! Given that on a daily basis, I am surrounded by boys of a certain age, I knew it was only a matter of time before another opportunity would arise to turn Star Wars into sugar. This time, it's for my cousin. A 10 year old, who like most others of his age, loves all things "Force-related". Thus, cupcakes and chocolate were dedicated to several favorite characters. Of course, my twins are now asking for a cake with the entire series portrayed, including the Death Star and General Greivous (the guy with 4 hands and therefore, 4 light sabers). I guess I'd better get to work figuring out that one, but in the meantime, who knew Yoda tasted so good? Be sure to check out the Azucar tab at the top to view my complete portfolio. 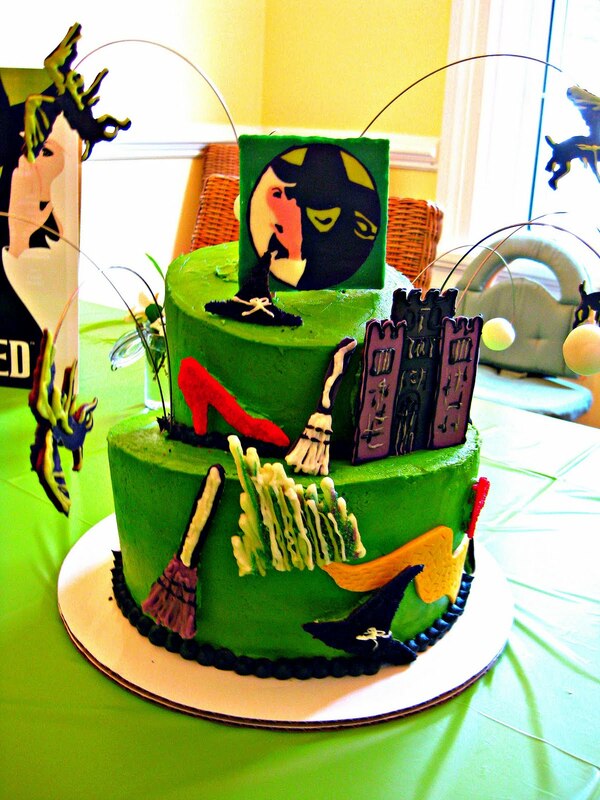 THAT IS ONE "WICKED" CAKE! I have been anticipating the delivery of today's cake since March! Today was the 3rd birthday party of a sweet little "best actress in a musical"-in-the-making, Claire. Her Mom and I have been friends for about 16 years. We are both vocalists and although we never sang together, our lives have paralleled for several years and in many ways. Some of my fondest memories were created during our time as neighbors on Strawberry Street in the Fan of Richmond. It was a great place to live and I am so grateful that despite the fact that we have moved on from that address, Marilyn is still in my life. Marilyn's little girl, although only just 3, has developed her mother's love for musical theater. The musical Wicked, in particular. She has seen the show several times and knows all the characters and music by heart. Claire's birthday party was themed around her favorite show, complete with yellow brick road sidewalk, castle bouncy house, flying monkey costume favors and of course, a cake to match. She also sported a precious dress that was custom made for her by my very talented neighbor, Mandy. Mandy owns Lucy's Closet, a custom embroidery and applique business. For Claire, she made a green gingham A-line dress with a witch's hat applique and embroidered "Defying Gravity", the show-stopping anthem of the musical. Look for Mandy online at http://www.lucysclosetbymandy.com/. Marilyn joked that the only thing missing was "SURRENDER DOROTHY" being written across the sky (although we acknowledged that technically, that all happened AFTER Wicked). Marilyn asked me to do Claire's cake back in March, and I have been so excited for today to finally arrive! Choco-mocha topsy-turvy cake with lime green vanilla buttercream. All figures and plaque topper are hand-painted chocolate, including the flying monkies circling the cake. Since the launch of CREO, I have been asked by several friends, "Where did all this come from? I never knew you wanted to be a baker." It's true. This is not something that I have secretely been pining to do...spending years dreaming of just how and when I would start my own "caking" business. Collecting recipes, fine tuning techniques, writing my business plan...nope, never happened. This is all just one big, happy accident. The truth is, I have for many years been nurturing my creative side. People who know me well will say that I have always been crafty. I learned to sew and crochet at a very young age, loved color and would re-arrange my room every few weeks, trying desperately to make my pitiful little escape just a little more aesthetically pleasing. In my young adult years, however, I channeled all those creative energies into the performing arts. Fine tuning my craft as a singer/dancer (and having lots of fun along the way) occupied every waking moment. It was during several soul-searching months in Nashville that I began to re-connect with visual arts - drawing, painting, decorating. I think I decided then that I always needed to have some sort of project in play to feel truly fulfillled. All of that manifested itself in painting anything I could get my hands on (pottery, lampshades, floorcloths), jewelry-making and ultimately, lots of household DIY projects. Add into the mix a love for cooking that I never knew I had (years on cruise ships prohibited exploration of that hobby). So when my boys came along, I was drawn to what seems to be a rite of passage for most new moms..let me see how I do baking them a birthday cake. My amazing MIL had given me a cake decorating starter kit (thanks, Mom!) and I was off to the races. I didn't think much of it all at first. Just had fun with it and was quite pleased with the results. But the more complex the designs, the more excited I became at the possibilities. The skills that I have been nurturing all these years...building, cooking, painting...they all just happen to coincide in the form of a "caker"!!! At the same time, I had left my advertising gig of 14 years and was looking for a way to bring in some extra cash, as well as keeping the artist in me alive. I hadn't realized how much I had really wanted to own my own business until I went to my bookshelf and found no fewer than 5 books on "How to follow your passion and start your own business", "Creative Cash"...you get the picture. So, I started researching, asking questions, playing with recipes and CREO was born. Now with each confectionary project, I find myself learning something new - a way to blend colors, a tweak to a recipe, a construction method or a piping or decorative technique. This week was especially challenging and fulfilling. I was asked to re-create a wedding cake from the 1970's for a couple who was being surprised with a 40th wedding anniversary party. The cake was very traditional, with tiers and columns, lace doilies, lots of fluffy buttercream and tons of greenery. The party's host (and a dear friend) and I did our best to interpret the original design in a way that was tasteful, yet true to the integrity of the original. I learned how to tier a cake and make fondant roses for this project..and I think we were all quite pleased with the end result! So, that's how all this happened. And now each week seems to bring me a new design challenge - which I thrive on! "Wicked - The Cake" is next week with Star Wars cupcakes to follow! My beautiful friend has been planning a 2nd birthday party for her son. 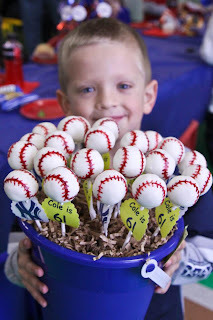 He already seems to be quite the sports nut, so she asked me to do cakepops in the form of several different types of balls. In the process of making these, I have to admit that my baking materials have been testing my patience. Some of the candy colors melt to a better dipping consistency than others, which means that I have to make lots of extras to allow for some clunkers. Let's just say I almost threw several cake tennis balls through the window, not mention all the four letter words that were flying as well. But, my hope with the trouble-shooting is that I am getting better and smarter at what I am doing. I finally managed to complete 4 different ball designs, complete with personalized pop signs. I think young Branson will be happy with his treats on a stick. They give new meaning to ballpark food. Coming soon..."Wicked - The Cake"
and squeeze from the bottom, up. This was a rule of thumb that I often heard in ballet class to help strengthen my center and develop proper dancer posture. As hard and repetitive as ballet tended to be, it really was an excellent foundation for other types of dance that I was interested in and asked to perform in various shows. The same concept was true for singing. Learn the craft with classical techniques and you can then build upon those skills to master any variety of styles. I now carry those same practices into the development of my cake decorating skills. I seem to have initially gravitated toward several non-traditional techniques (painted chocolate) and product offerings (cakepops) as I love the variety and opportunities for artistic expression that they provide. However, I want to make sure that I also know more traditional techniques so that I can satisfy any number of client preferences. I have just completed my 2nd and 3rd cake classes, Flowers & Cake Design and Fondant & Gumpaste and have found that I very much love the detail work involved in the creation of sugar flowers and figures. I look forward to continuing to experiment with development of my signature style through combining these classic techniques with newer concepts. Here are some of my lessons learned. In a few weeks, I will be re-creating a traditional wedding cake for a 40th wedding anniversary. The topper features yellow rosebuds, so I have been practicing creating those with fondant. This is a very detailed technique where each petal is created separately and then adhered to the bud base with gumpaste glue. It is time-intensive, but I think it produces an elegant and very realistic flower. I will enhance the coloring with shimmery lustre dust before placing on the cake. Another flower technique is to pipe a more informal rose and rosette with buttercream. The cupcakes here were just for practice and not as finished as I normally like them, but you get the idea. I love the white on white. Perfect for a bridal shower or even as a complement or alternative to a wedding cake. 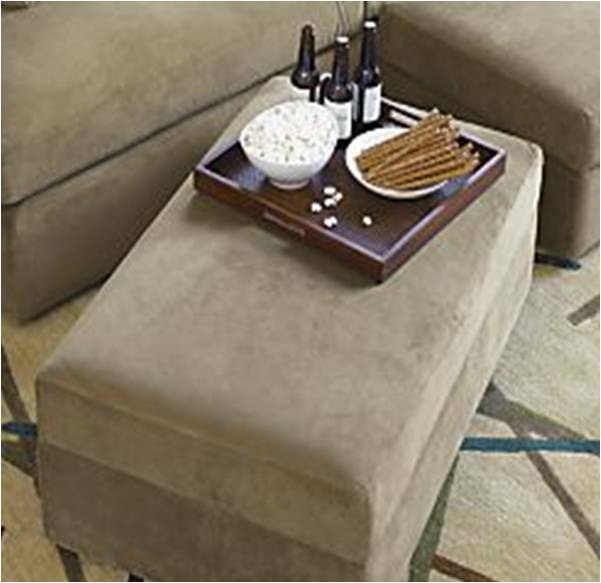 Picture these in your favorite color combinations! Many people love the clean and finished look that a fondant-covered cake provides. If you have never had one, the texture and taste is very different from a buttercream or other creamy type of frosting. It’s very much a matter of preference. I happen to love buttercream or cream cheese icing. This cake, which I made for the family for Memorial Day, combines a fondant-covered cake base, cake, fondant bow and stars. Until next time! Remember…squeeze like a tube of toothpaste! WHAM! POW! BAM! This week's cake has been crazy fun to make! The task was to pay tribute to a sweet 3 year old little man's love for Batman as he celebrates his 4th birthday this weekend. His family are neighbors and they will be going all out with a Batman moonbounce and the rest of the works. I am thrilled to present what I think might be the coolest Batman cake that I have ever seen! White almond cake with vanilla buttercream will please all palates. Topped with painted chocolate figures. I haven't talked alot about what goes into this technique. It's definitely a labor..but one that I love. The chocolate is difficult to pipe finely, so I do details and outlines with a toothpick (I might go blind soon - as well as get carpel tunnel). And there is alot of planning in figuring out which colors to apply and in what order as there is limited working time once the chocolate is melted. It's a process, but I think it makes the cake. I love this so much - almost don't want anyone to eat it! Next big project on tap is a re-creation of a 1970's wedding cake for a 40th wedding anniversary party. It will be traditional, tiered and columned with sugar roses. My first columned cake - can't wait to tackle it! TIS THE SEASON...FOR A WEDDING, THAT IS! A wedding is always a great excuse to have sweets, right? A friend and former Martin Agency co-worker of mine is the mother-of-the-bride this weekend and asked me to help her put together some surprises for various family members and guests. I first met the bride when she was in high school...and she is now a lovely young woman, living in NY and working for CNN online. I am honored to have been asked to provide treats for her special weekend. The couple elected not to have a traditional wedding cake at the reception. However, the MotB wanted to surprise the bride with a cake for the rehearsal dinner. The dinner is themed - Roarin' 20's - so I created this cake to complement. The topper is a plaque using the painted chocolate technique - all painted by hand and all edible. Calla lilies were added at the base of the feathers after delivery. Bride and Groom cakepops will be provided in the wedding party dressing rooms prior to the ceremony. The Groom's family hails from India, so they will receive sari-inspired pops as a hotel room treat. The Bride's family will receive a variety of pop flavors in their hotel in the elegant color scheme of the wedding...lavender, brown, white. No, I'm not talking in the "don't stand so close to me" way. I'm talking in the "thank you for helping my kids become the best little people that they can be" kind of way. I have a million thank-yous in my heart for a handful of what I consider to the be the best of the best teachers. These are the ones who taught me not only the curriculum, but also who I wanted to be through those lessons. One stands out among all the rest. My high school choir director, Vernon Pipkin, remains to this day the biggest musical mentor in my life. His love for his students and his way of making us realize our fullest potential will always make him the "music man who gave us more than music". He died of cancer only 4 years after I graduated high school. He was in his 30s. I know that he is still missed by all of us who were so lucky to have been his students. This week is Teacher Appreciation Week and my kids' school has a full agenda of thank-you activities to show the staff the love they deserve. Today, the PTA hosted a luncheon and raffle for the teachers. CREO donated some special treats to be raffled off. All made with lots of teacher love for the special people that help mold us into who we are destined to be. CREO is licensed and insured. My kitchen has been inspected and certified as a commercial kitchen by the VA Department of Agriculture. Thank you so much for visiting my site. I am fortunate to have been down a few paths during my life...professional singer/dancer, advertising supervisor...now a mom to twin boys and entrepreneur. I live to love and create and feel that this venture has finally brought my heart home. I hope you enjoy. Where else to find me! Email me at creobycathy@gmail.com or find me on Facebook.